‘Momo’ is a traditional delicacy of China, Bhutan and Tibet. It’s very famous all across North East India and Nepal. These are dumplings made of flour, water and meat or vegetables. It’s a very simple appetiser which is served with a hot soup and a spicy dip. The best part is you can steam it instead of frying and cut on all those caloriesJ. Here I have made it with minced pork, you can make it with any kind of minced meat that you like or even vegetables. Go ahead try it! Mix flour with little salt, 1 tspn of oil and add water to make soft dough. Once the dough is prepared make some round balls from it. Roll them into small round disc shapes. Take a tea spoon and fill the flour discs with the filling and fold them properly at the edges so that they don’t open up. Fill the lower base of the steamer with water and grease the steamer plate with little oil (so that the dumplings do not stick to the plate when you are taking it out). Place the dumplings in the steamer and steam cook them for 15-20 mins. And that’s it your quick steamed pork momo is good to go. You can just serve it with the dip or can also serve with a hot soup. 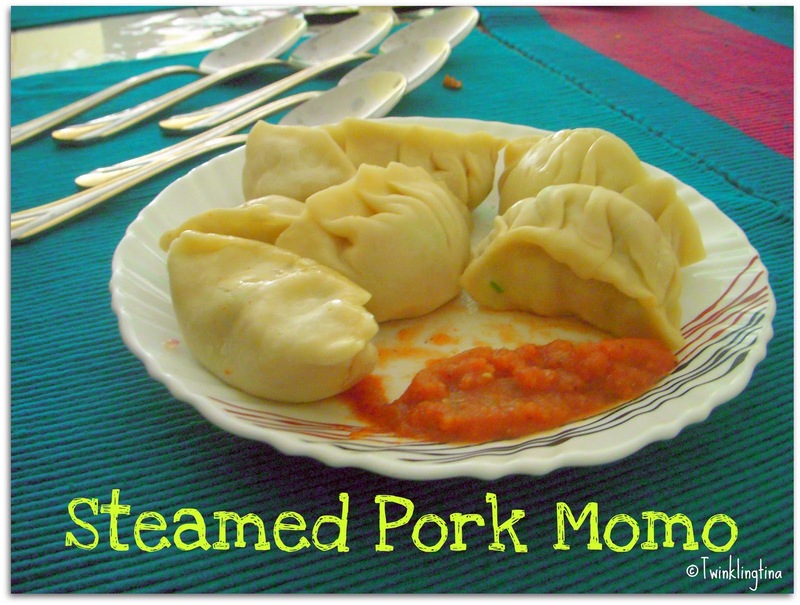 Enjoy your momos and let me know about your experience with this traditional appetizer. you know as a student, i remember momos as divine saviors, easy on the pocket and heaven sent for the taste buds !! Add Sichuan pepper ( grind it) in your tomato dip. The best dip ever to have with Pork momos!